After making initial moves to launch its IPO in June, High Times has announced that investors are backing the cannabis-focused content company. High Times has cleared escrow for $5 million from the SEC Regulation A+ filing. “We have only recently started the process of offering our shares to the public, but to date, we have received support and purchases from over 6,000 investors in our community,” stated Adam Levin, High Times CEO. The company says it received backing from a large number of retail investors the brand was looking to engage in June. High Times took its first major steps to go public earlier this summer with an “equity crowdfunding campaign” that allows investors to buy shares of the company at a discounted rate before it lists on the Nasdaq. High Times shares are set at a value of $11, a 10% discount from the anticipated opening price on the Nasdaq. The Reg. A+ filing has a $50 million cap. “Given the fan base we created, it is important we allow our loyal brand followers the opportunity to become equity owners of the company,” Levin said at the time. “It was important to me that this offering be open to anyone who wants to join this historic moment, not just those with big brokerage accounts,” Levin added. The 40-year-old company distinguishes itself as a business focused on media and events tied to legal cannabis culture — it does not distribute cannabis or cannabis-infused products. 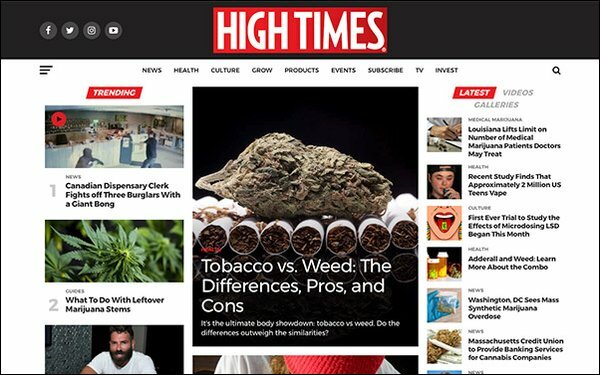 High Times, which has published a monthly print magazine since 1974, plans to use the capital from the IPO to expand its publishing, events and licensing businesses, as well as invest in video and audio content and add product lines and brands. Itmakes most of its revenue from its events, such as its popular Cannabis Cup, one of the world’s biggest marijuana-focused trade shows. There will now be an “Investor’s Village” at the Cup, Levin said. The company also closed two acquisitions this year: It bought Green Rush Dailyin April, and acquired Culture magazine from Southland Publishing, Inc.
High Times is extending its Reg. A+ deadline for investing in the IPO until October 31.